Dean Hall, the man responsible for kick-starting the survival phenomenon with DayZ, has made his VR debut with HTC Vive-exclusive Out of Ammo. A strategy/shooter hybrid, it’s available on Steam Early Access now. Just getting started with virtual reality? These are the best VR games you can buy. The game is the first from Hall’s new studio RocketWerkz, and casts players as the commander of a battlefield. As a floating strategy master, you’ll be able to issue orders to troops, build defenses, and call in airstrikes. But as well as being a strategy game, Out of Ammo is also a shooter. You can possess your troops and control them directly as in an FPS. 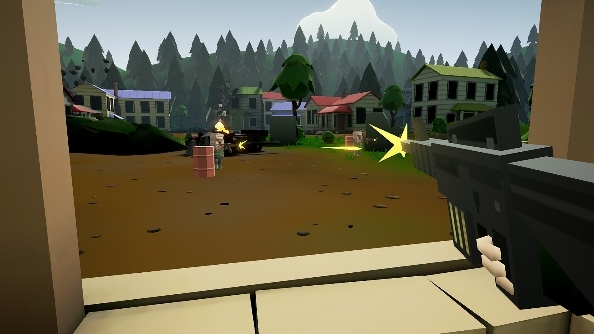 With its Minecraft-like blocky graphics, Out of Ammo looks akin to Block N Load, although clearly plays quite differently. Soldiers available to deploy and play as are the Rifleman, Sniper, Rocketeer, Medic and Engineer, and your first battlegrounds are Woodland, Desert, Alpine, and Urban environments. The current build is said to be “a bit clunky to use and unintuitive”, but as an Early Access game you can expect updates to gradually beat it into shape. If you’ve got yourself a HTC Vive, then you’re good to play. Out of Ammo is priced £10.99/$14.99.